We worship at 10:00 AM and 6:00 PM every Sunday and we would love to have you join us! Click here for bulletins. Our worship services are best described as an eclectic celebration of the diversity of worship expressions. We draw our music from classic hymnody, contemporary praise music, independent folk artists, global music, and everything in between. 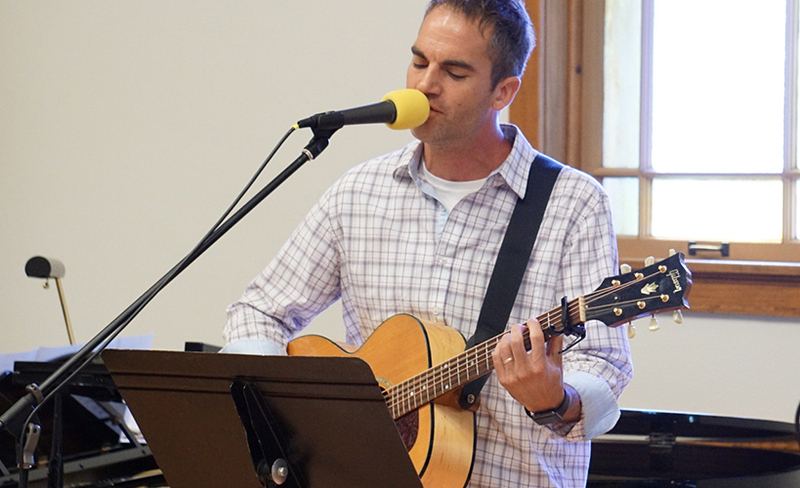 Our worship incorporates piano, guitar, organ, drums, strings, and other instruments as appropriate to the music. • we have seasonal choirs and small vocal ensembles, and the occasional intergenerational orchestra and dramatic interpretation of scripture. Please read more about what guides us in the worship statement below. We celebrate Communion as a body every first Sunday of the month in our morning service and every other third Sunday in the evening service. We gather together for prayer services–small group, Vespers or Liturgical–every fourth Sunday of the month in the evening. We also plan an annual outdoor worship service and occasional intergenerational services which include a time of food, fellowship, and learning together. There are many opportunities to get involved in worship! If you are interested in using your gifts in worship–as a worship planner, musician, worship leader, scripture reader, singer, artist, sound operator or projectionist–please fill in the worship resource survey at this link or contact Rebecca De Vries, Covenant’s worship coordinator (worship@covenantcrc.net). From earliest times, God has called his people to worship. Rituals of worship governed every aspect of daily life in the Old Testament; each Sabbath was set aside for worship; and feast days celebrated throughout the year drew God’s people together for worship. Jesus regularly went to the synagogue to worship, and Paul instructed the New Testament church to “let the word of Christ dwell in you richly as you teach and admonish one another with wisdom, and as you sing psalms and hymns and spiritual songs with gratitude in your hearts to God” (Col. 3:16b). What theological principles undergird our worship? What are the purposes of worship? Who are the participants in our worship? How does Reformed theology shape our practices? All of life is worship. Corporate worship, those occasions when God gathers us together to worship him, nurtures our sense of life as worship. It teaches us how to worship, showing us what God requires and prompting us to explore how worship may find expression in our daily lives. It calls us to acknowledge the rule of Christ in our lives and refreshes us for lives of service. Coming out of the Reformed tradition, we understand that worship begins with God: he made all things (the cosmos) to reflect himself and to worship him. He claims our worship because he made us, saves us, and sustains us. Our worship, then, is shaped by the many and deep ways in which we respond to God: in awe at the amazing world he created, in sorrow for sin and brokenness in that world, in joy and gratitude for his redemptive sacrifice for all of his creatures, and in hope for the new life to come. All of these responses belong to our worship. Trinitarian, acknowledging God as Father, Son, and Holy Spirit. As God is communal—Three in One—so worship should foster unity among God’s people.Word-centered, ensuring that the Word is central in our services. Preaching, liturgies, songs, and prayers should be biblical, reflecting the deep riches and mystery of God’s revelation. Redemptive-historical, connecting us to the biblical salvation story of God’s covenant love for his children from creation, through the fall, in the redemptive work of Jesus Christ, and until his kingdom is restored in the new creation. Our worship should connect to the church throughout history and in our contemporary world. It should create a sense of expectancy for the coming kingdom and acknowledge our membership in a world-wide church. Sacramental, bringing us near to God as did the Old Testament sacrifices and the New Testament sacraments of baptism and communion. Our worship should regularly include a celebration of the sacraments in ways that draw us near to God and to each other. Creator-Oriented, acknowledging that the sovereign Lord has called the entire cosmos into being, revealing his power, divinity, and love. He calls us as image bearers to live in covenant communion with him and one another, developing and caring for his amazing and complex world. We encourage one other to honor and serve him daily, loving one another and seeking the well-being of all he has made. Dialogic, listening to God speak and responding to him in obedience, praise, and action. In our worship, we should experience God. Grace-filled, celebrating God’s abundant and amazing grace. Our worship should reflect this profound reality. sharpen our understanding so that our faith is strengthened. offer our praise and thanksgiving, acknowledge our sins, bring our petitions, and give our offerings. tell the good news of salvation and bring the healing hand of justice to the lost and suffering world. God meets us, his people, in worship, speaking to us through his presence, his Word, and the sacraments. Worship services at Covenant should engage everyone who attends. We want to craft services in which people of all ages, at all stages of life, and people of other Christian traditions can bring honor and glory to the Lord. We respond together in liturgies and raise our voices in congregational singing as one body of believers. We provide children’s worship for our preschoolers and welcome children to the Lord’s Table. We involve young people in various aspects of our services. We look to mature members for wisdom and understanding and acknowledge their role in passing the faith to younger generations. We value family participation in worship, and we embrace singles as brothers and sisters in Christ. We welcome people of all racial and ethnic backgrounds. We enfold the gifted, the needy, those broken in body or in spirit, the mentally or physically challenged, the introvert and the extrovert. Building on our denominational worship history and a tradition that pushes us to be continually reforming, we draw from tried and true traditions as we explore and develop new ones. We want to worship together in biblically appropriate ways that allow us to hear God’s Word for living in today’s world, feel his presence in our lives, and express our praise and gratitude to him as our Maker, Savior, and Sustainer. As a congregation we embrace a historic Reformed liturgical order of worship. Even though every traditional element of worship may not be obvious in each service, this gives us a structure from which to plan services and the flexibility to be creative and relevant. The elders oversee our worship services. Finally, our worship is a public expression of love; our love of God and our love of each other. Therefore, to paraphrase the words of St. Paul, if our liturgy speaks with the best poetry of men and if our choir sings like the angels, but does not have love, we are only a resounding gong or a clanging cymbal. If our preaching has the gift of prophecy and our teaching has the theological depth to fathom all mysteries and all knowledge and if our professions of faith can move mountains but do not have love, they are nothing. If we give all we possess to the offering plate and give over our bodies to work projects, but do not have love, we gain nothing. If we worship in love, our worship cannot fail.